Waimea Canyon should top your Kauai vacation’s must-do list, especially if it’s your first time visiting this wonderful island. There are plenty of things to do in Kauai’s Waimea Canyon, whether you want to take a short hike or spend all day exploring the canyon’s natural wonders. This canyon is widely known as “the Grand Canyon of the Pacific” and offers some of the most amazing views you’ll see on your trip. The gorge is ten miles long and more than half a mile deep. Kauai is the oldest of the Hawaiian Islands and, like its neighbors, was formed by a volcano pushing its way to the surface of the ocean. Millions of years ago, when part of the island collapsed, the canyon began to form. Since then, the island has suffered landslides, collapse, and erosion, which has helped to shape the island’s unique geology, including the Na Pali coast and Waimea Canyon. The first thing to do when you visit the park is take Waimea Canyon Drive and stop at scenic lookout points along the way. They will all offer scenic overviews of the canyon’s surreal landscape. The park is open during daylight hours and you’ll be allowed to engage in several activities, including picnicking, sightseeing, and hiking. 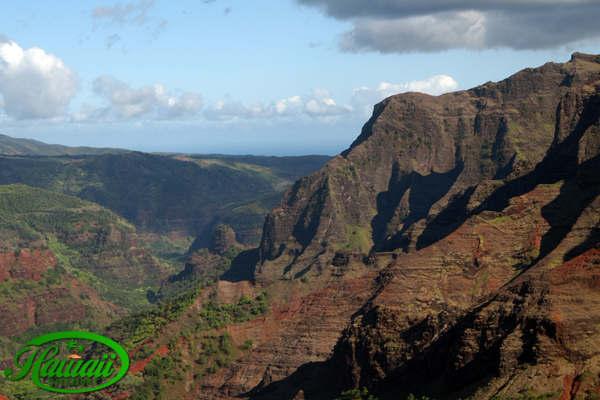 One of the best ways to see Waimea Canyon is from the inside. There are a number of hiking trails that will take you into the canyon itself, offering views that rival those you’ll see from the lookouts. The Canyon Trail is a must if you’re okay with a little bit of climbing. Though this trail isn’t ideal for beginners or people who are out of shape, give it a try if you’ve got any hiking blood in you at all. A few hours roundtrip will give you a bit of exercise and wonderful views of waterfalls, tropical jungles, and the canyon itself. Kukui Trail is another good option if you’re up for a challenge. This 2.5-mile hike takes you down the west side of the canyon straight to the canyon floor. Wilderness junkies can buy a camping permit ahead of time and camp at the end of the trail. Perhaps the easiest trail is the Iliau Nature Loop, an extremely short roadside loop trail. This flat dirt trail takes you to another picturesque overlook. Hiking is one of the most popular ways to explore the canyon, but for really unique and memorable views of the canyon, try a guided tour. Polynesian Adventure Tours runs a 7-hour Waimea Canyon Experience tour that escorts you to a number of sightseeing locations in addition to Waimea Canyon itself. This popular tour company also runs the Waimea Canyon and Wailua River Tour, which takes groups through the canyon, along the Wailua River, and into Hanapepe Valley. Finally, for something truly extraordinary, hop aboard one of Kauai’s many helicopter tours, which circle the entire island from high above, presenting aerial views of Waimea Canyon, the Na Pali coast, and other sights. To book affordable Hawaii tours or activities, call 1-866-482-9775 today.